Integrated project-based learning and real-world internship experiences build the crucial link between academic achievement and future economic success. MC2 STEM High School is an unusual year-round public school of about 270 students, located in Cleveland, Ohio. The school emphasizes integrated project-based learning, partnerships with business professionals, and real-world internship experiences to help students understand the crucial link between academic achievement and their future economic success. Students attend classes at campuses embedded in business and school sites around the city -- the Great Lakes Science Center, General Electric Lighting's Nela Park campus, and various college campuses. At any given time, you may see freshmen and sophomores immersed in workshops with tutors from NASA or in rigorous projects and mentorship programs with engineers from GE Lighting, or juniors and seniors stepping up to demanding internships at a variety of local businesses. While STEM is the school's emphasis, teachers cover all subjects required by Ohio's state standards through integrated, transdisciplinary project-based learning. Transdisciplinary project-based learning means integrating the content of academic subjects across school and non-school settings. Each 10 week project called a “Capstone” is designed thematically to meet the Ohio state standards, make connections to Higher Ed and be relevant to industry needs and includes one to two deliverables for assessment. Clear performance rubrics are provided so students know exactly what is required for mastery. The MC2 STEM High School campus embeds real-world experiences by existing on district school sites (Health Careers Center), several college campuses and the Freshman and sophomore campuses are even embedded on business sites around the city. On any given day, students will be immersed in workshops with tutors from NASA, working on rigorous projects and mentorships with engineers from GE Lighting or participating in internships at various local businesses. 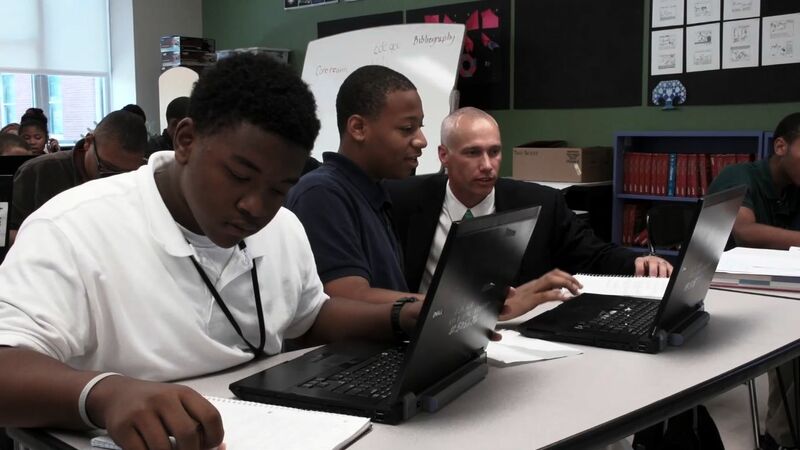 Every grade level provides opportunities for students to interact with businesses. In 9th grade, students are at the NASA Glenn Research Center four times a year. 10th grade students attend classes at the General Electric Lighting Campus and are paired with a “GE Buddy”. There is a mandatory sophomore project which GE business leaders assess. Grades 11-12, students can participate in internships at local businesses. The MC2 STEM High School uses a mastery assessment system for grading instead of letter grades A-F. Every student, 9-10th grade, must achieve 90% on benchmark assessments before receiving an “M” for mastery and credit is given for the course. Behavioral expectations of professionals and maturity are strictly enforced because students attend classes on business property are surrounded by business professionals every day. At the same time the school has the feeling of family that students can rely on for support. Data is from the 2010-2011 academic year.